A helicopter drops Ben off in Jamaica, and while it's not a full-on date I'll take any helicopter you give me. Ben thinks Jamaica is the perfect place to find love, like most of the other destinations he's visited. There's a long montage of Ben explaining why he likes each woman and the women wistfully ponder love in various staged moments, but who cares! It's time for overnight dates AKA Fantasy Suites AKA the Bone Zone. First up is Caila, who goes on rafting trip down the river with Ben. And I don't mean white water rafting, it's like a Tom Sawyer Island raft. Someone on Survivor would kill for this raft. 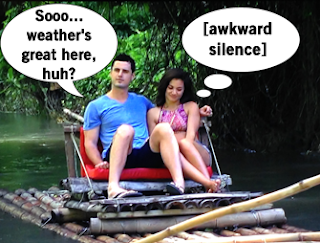 What should be a fun day date on the water is totally uncomfortable with little to no conversation, which Ben accurately deduces that Caila is stressed and nervous. Caila is nervous that there are still two women left and is totally in her head about dropping the "I love you" to Ben. Good thing the day/night is young, so Caila is able to seize the opportunity to tell Ben her true feelings about the process and her feelings for him over dinner. Caila tells Ben she loves him, which wakes him up from his heavy, sleepy blinking. With the Fantasy Suite key accepted, Ben and Caila throw on their swimsuits and make out under fireworks in the ocean, then head to the boudoir for a little "off-camera time." WIIIIINK! They bask in the afterglow the next morning with Caila OK with Ben not saying "love you" back because she just knows he does. Date #2 is with Lauren B, whose shorts are so teeny and tight I swear it affects the way she walks. Ben and Lauren board a little boat and enjoy actually talking to each other, then land on a little island to help release a nest of baby sea turtles. Hearts melting around the globe! Lauren's heart is melting at the turtles and Ben, who tells her how he cried while talking about her to her sister. Their perfect day ends with kissing under a rainbow, which only means the night will be more perfect. Lauren and Ben take in a local jam band before heading to their secluded romantic dinner, the perfect candlelit setting for Lauren B to talk about her feelings and insecurity of this process. Lauren and Ben head to the Fantasy Suite where she tells him he's the man of her dreams and she's in love with him. But then, WHOA, Ben tells Lauren he's known he's been in love with her for awhile. It's pure joy now as the couple keep saying "I love you" and makeout before closing the sheer curtain of the hotel room. Uh Ben, we can still see you. The next morning they're happy as ever with clothes strewn all over the floor - what a true fantasy! Ben and JoJo hop into the Sandals Resort helicopter to fly to the NS Falls in Negril for a day of making out by waterfalls, which means an never-ending urge to pee from the sound of cascading water. Despite her nerves to say it, JoJo tells Ben she loves him and doesn't want to even think about losing him. Ben's response, "JoJo, I love you too." Then they make out a bunch. YUP. Oh Ben, you are in a real pickle. At night JoJo and Ben pretend to have dinner which is a good time to discuss the disastrous hometown date with her brothers. JoJo explains they are overprotective and don't want her to return heartbroken. JoJo and Ben obviously use the Fantasy Suite key to head to the Bone Zone to makeout in a tiny pool and then on the bed. It's a great distraction for when you realize you're in for a real shitstorm after telling two women you love them. Their morning is full of kissing, snuggling, and eating fruit salad. It's all so sweet. Now that he's two "I love yous" deep, Ben knows he is not in love with Caila. So while Ben is thinking about how awkward the Rose Ceremony will be, Caila gets "inspired" to take an Uber to his hotel and visit him. Caila's all giggly as she totally breaks into Ben's AirBnB and BOO! Gotcha Ben! He gets over his initial surprise to have a chat with Caila on a flight of stairs. Ben tells Caila he's in love with two women here and he can't say it back to her and feels bad having to say goodbye to her. "That sounds like a line," Caila says because it is such a show cliche. Caila lets Ben walk her back to the Uber and after a parting goodbye, Caila re-jumps out of the limo and wants to know if he knew this entire week he was going to dump her. Ben says no and says their relationship was important to him. They part with a hug and some tears, before some in-Uber sobbing. Chris Harrison greets each of the two remaining women individually and gets the gossip that Ben said "I love you" to which he gives a knowing nod and likely holding back a laugh. Both girls are so nervous at the prospect of only two roses until they realize Caila's not coming. Ben comes out not for an elimination but to say JoJo and Lauren B are his final two. Three-way hug of weirdness, bring it in!